This classic bistro dish of pepper-crusted steak with a cognac-flavored cream sauce is found on menus throughout France but is rarely served at home. One reason may be that preparing the sauce is a bit trickier than one might imagine. But if you follow the steps below, there is no danger of your skillet going up in flames. The first step is to pat crushed black peppercorns onto the steak and pan-sear it to medium rare (or as you prefer). The second is to prepare a sauce with cognac and cream. The sauce is then spooned over the beef for an elegant dish. As always, the results will depend on the quality of the ingredients, and first and foremost the steak. Choose a tender cut, for example tenderloin, filet mignon, sirloin, strip or rib-eye (in the States), rump, fillet or sirloin (in Britain), rumsteak or filet (in France). Have the steaks cut fairly thick — about 1 inch (2.5 cm) is good. 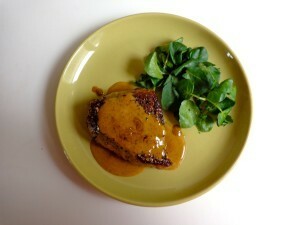 Steak au poivre is traditionally served with French fries and a small mound of watercress. Alternative veggies could be potatoes of any sort, for example roasted rosemary potatoes, or a purée of carrots or celeriac, French style green beans or — given the season — a spring vegetable medley. The other essential ingredient is a good bottle of red. The quantities below are for two people. Have an oven-proof dish standing ready before you begin. A pie or cake pan will be fine. Trim away any fat from around the edges of the steaks. Pat them dry with paper towels. 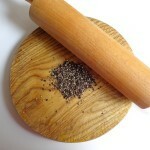 Measure the peppercorns onto a board and crush them using a rolling pin. This requires a certain amount of biceps power. Roll over the peppercorns a couple of times, then gather them into a heap and crush again, repeating until you have no whole peppercorns left. The cracked pepper will form larger bits than you would get if using a pepper grinder. Pat the peppercorns onto one side of each steak. Turn over and pat onto the other side. Preheat the oven to a low temperature, gas mark 2 (150 F, 60 C). In a heavy-bottomed skillet, heat the oil to sizzling. Sear the steaks over high heat for about one minute per side. Add the butter and continue cooking the steaks over high heat for 1-2 minutes more per side. The cooking time will depend on the thickness of the steaks. For steaks about 1 inch (2.5 cm) thick, count about 5 minutes cooking time in total for medium rare meat. For rare cook 1 minute less and for medium cook 1 minute more. You can test the meat while it’s cooking by pressing down on it gently with your fingers. When you feel some resistance, it will be medium rare. When the steaks are done to your liking, transfer them to your oven-proof pan and place them in the oven. Drain off the fat from the skillet (I do this by pouring it into the sink), but do not wipe the pan clean. You want to keep the meat juices that are clinging to the bottom and sides while discarding the fat, which otherwise can flame up. Put the skillet back on the stove, but — very important! — not on the burner you used to cook the steaks, which may still be hot. Add the cognac, which will bubble. Using a wooden spatula, stir it around to incorporate the meat juices clinging to the skillet. Add the cream and stir to blend. Place the skillet over a low flame and heat the sauce until it is simmering, but not boiling. Allow it to cook until it thickens, about 1 minute. Remove the steaks from the oven and sprinkle with salt. Serve on individual plates, either whole or sliced. Spoon the sauce over the steaks. Serve piping hot. Serves 2. 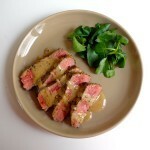 Many recipes for steak au poivre call for salting the beef before it is cooked. I do not recommend this, as the salt draws the juice from the meat. Some recipes also call for adding sautéd shallots to the sauce, but I have never seen steak au poivre served this way in France.